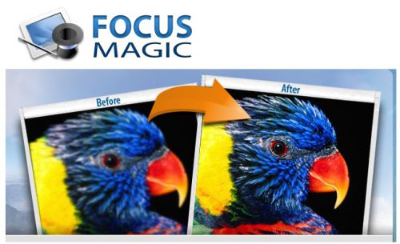 Focus Magic uses advanced forensic strength deconvolution technology to literally “undo” blur. It can repair both out-of-focus blur and motion blur (camera shake) in an image. It is the only software that can significantly recover lost detail from blurry images. In the past, Unsharp Mask was seen as the best way to sharpen photographs which were a little blurred. It increases the contrast of the edges of an image to make it look sharper. There are many programs which have Unsharp Mask (or Sharpen) included, and there are even some dedicated Unsharp Mask programs. The mathematics is quite simple, and it runs quite fast. Focus Magic however doesn’t use the Unsharp Mask principle to sharpen an image. It uses advanced deconvolution to reverse the way in which the image got out of focus to restore the original “in focus” image as much as possible. Now The World’s Most Accurate Sharpening Software. We spent an hour taking deliberately blurred photos of a porcelain parrot (see left). This included out-of-focus images and motion blurred images with many different degrees of blur. We then fed them through lots of software applications. A small zoomed-in section of the image is displayed for your comparison. Focus Magic is the only software available that can recover the license plate shown. It uses the most sophisticated deconvolution technology to literally “undo” blur.